The title screen for ‘Golden Axe Warrior’, a Sega Master System game that is a top-down RPG based in the ‘Golden Axe’ universe. 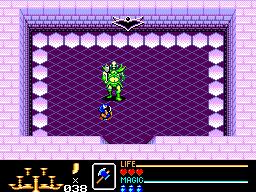 Golden Axe Warrior, released in 1991 for the Sega Master System, could best be described as Sega’s answer to The Legend of Zelda. Golden Axe Warrior is a spin-off of the Golden Axe games but is more of an action RPG then a straightforward action game like the series. The plot involves finding nine crystals and the Golden Axe to defeat Death Adder. 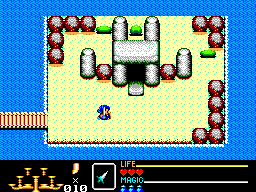 The game features a rather large overworld along with hidden underground labyrinths in which the crystals can be found. Each crystal is guarded by monsters that must be defeated (including a boss) and puzzles that must be solved. Chances are that if you are a fan of Zelda or action RPGs in general then you will like this game. How you feel about it compared to Zelda will probably depend on how much of a Zelda fan you are vs. how much of a Golden Axe fan you are. Opinions are divided but this is a game all action RPG fans should try. Unfortunately, there really isn’t a direct sequel of follow-up to this game. The closest thing to a sequel would probably be Ax Battler: A Legend of Golden Axe which appeared on the Game Gear around the same time and was somewhat similar to Zelda II. A follow-up on the Genesis would have been really nice (e.g. an equivalent to A Link to the Past on the Super Nintendo). Also unfortunate is that this game is pretty rare and if you are looking for an original you’ll probably have to pay a pretty high price. The good news is there is another option. Golden Axe Warrior was included as an unlockable game in Sonic’s Ultimate Genesis Collection for the PS3 and Xbox 360. It will be a little easier to find in this form. Then there is always the emulation route. ‘Tom & Jerry: The Movie’ for the Sega Master System and Game Gear features Sonic posters in the background of the City level – though each version is slightly different. The video game, Tom and Jerry: The Movie was a tie-in to the movie of the same name in 1992. Yes, for those that missed it, there was a Tom and Jerry movie in 1992. The game was released for the Sega Master System and Game Gear and appears to have no real relation to the movie other than the name and starring characters. Game GearLike most licensed games, it is really mediocre at best. Not a horrible game but there are far better platformers out there. You get to play the role of Tom as he chases Jerry down in a series of levels. If you are particularly good, you can catch Jerry and end the level early. Otherwise, you have a puzzle to solve at the end of each level which determines whether you catch him or not. There are a variety of environmental obstacles to avoid or overcome and Jerry will of course make your job harder. In addition to running through dangerous areas, he drops mines and bombs in an attempt to stop you. If Jerry gets out of sight then you lose. While the game play of the Sega Master System and Game Gear versions are almost identical, the levels are completely different. If you like one, you will probably like the other. Having said that, unless you are a big Tom and Jerry fan (and really, who isn’t? ), then you should probably avoid this one. It’s an ok platformer but if Tom and Jerry doesn’t appeal to you then there are far better ones to play. As far as I know, this game has not been re-released so you’ll have to track down an original or use emulation if you want to give it a try. As far as getting an original, the big screen (SMS) version is far preferable to the Game Gear version not because of any game play reasons but because I hate looking at the tiny, low quality (by today’s standards) screen of the Game Gear. The Sega Master System has the somewhat dubious distinction of being the only game console to feature a game based on the TV series ALF. While ALF was a decent sitcom, the game suffers from many of the problems common to licensed games. Graphics, sound and game play are all mediocre at best and there was not a sufficient budget to make a decent game. 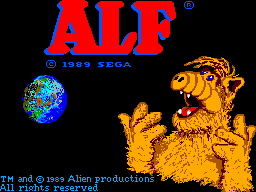 In ALF you control the title character who must find various items in order to repair his spaceship. You can freely roam around many areas in the game and you have to figure out which items to use to defeat certain enemies, get to certain spaceship pieces, etc. As far as concept goes it wasn’t terrible but it was the execution that was lacking. Other than being a huge fan of the show, there isn’t much reason to play this game. 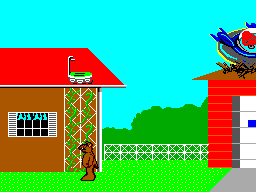 It is unique in that it is the only console based ALF game. There was also a computer game for various home computers and a couple of education titles but no other console game for the Sega Master System or any other console. This game has also not been re-released in any form so you will have to hunt down an original or resort to emulation if you do decide to give it a try.